While some locations are definitely being negatively impacted this year, the July precipitation deficit is likely not going to be critical to the final corn yield. 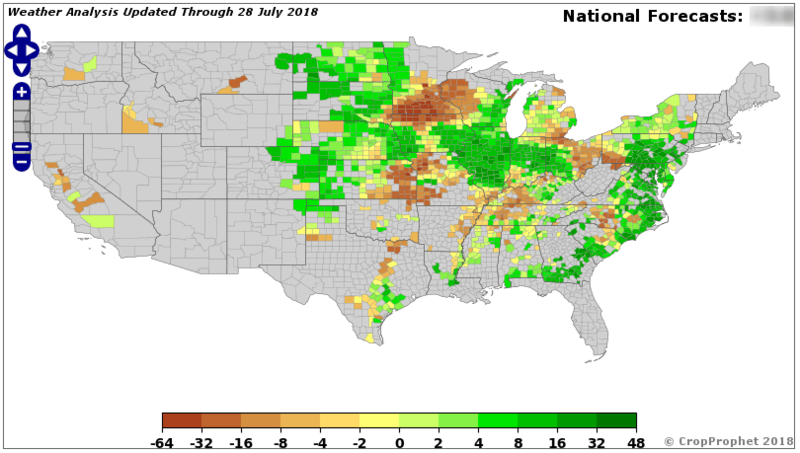 As the map below indicates, much of the US grain belt experienced below normal precipitation in July, 2018. Missouri was the worst case with 73% of corn growing counties experiencing 60% below normal or worse precipitation amounts. July is the most important month for the development or corn yield and the weather conditions during this month play a large role for determining end of season corn yield. While conditions were dyer than normal, except for Missouri, conditions were no so dry as to substantially negatively impact the crop. The chart below shows the percentage of corn growing counties in each state that experienced below normal precipitation. The states are sorted from left to right based on corn production. A dry Illinois is more likely to impact the national corn yield forecast than a dry North Carolina, because of the difference in corn production between the two states. In this case 5 states had 90% or more counties with below normal precipitation. 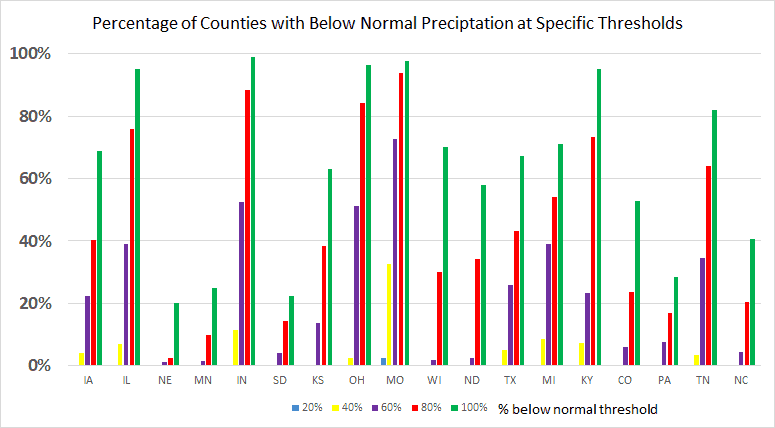 This is the same chart, expect that it shows the number of counties in each corn growing county that experienced 60% or less below normal precipitation in July. The next chart shows the same information but for “% of normal” thresholds of 20%, 40%, 60%, 80%, and 100%. So, you can see from the map and the graph that Nebraska was close to having all counties experience above normal precipitation conditions. Missouri, on the other hand, is the only state to have any counties that experienced 20% below normal precipitation conditions. Counties in Missouri usually receive between 1.5 and 2 inches of rain received 0.3 to 0.4 inches of rain. That kind of precipitation deficit definitely impacts crops. Much of the grain belt had good soil moisture heading into July, the critical time of the crop growth season. 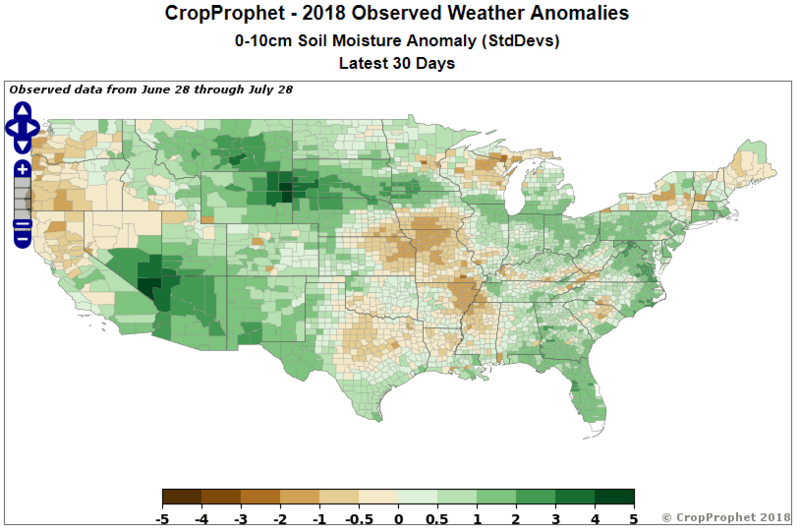 So, while precipitation deficits are never good for crops the impact this year was likely muted a bit by good soil moisture levels heading into July. The final yield at the end of the crop season is dependent on many weather factors occurring in approximately 1600 different counties across the United States over 6 months. Many variables are important to crop yields include temperatures, precipitation, soil moisture, solar radiation, and others. Small regional deviations in any variable can be important locally but are muted when analyzing yield at the national level. The map below shows the CropProphet county level forecasts in terms of deviation from the 2018 trend yield. The early season weather impacts on yield can be seen in different places. The precipitation deficit in Missouri is certainly evident. It appears that Illinois in the sweet spot for the 2018 season. 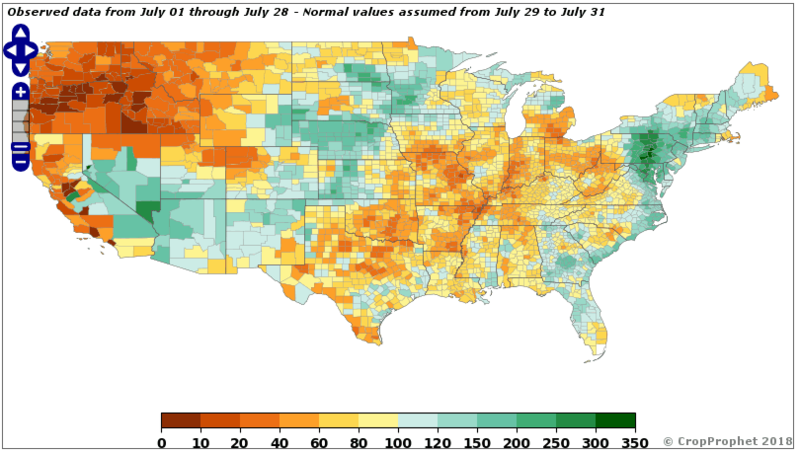 While the July below normal precipitation certainly had an impact across broad regions of the grain belt, the impact is not so great as to be a substantial concern on the overall corn yield prediction. Every year the weather and it’s impact on grains crops is a complex relationship. CropProphet captures this complexity by quantifying the impact of weather on corn yields. The detailed information that quantifies the impact of weather on crops is available only from CropProphet. Request your trial today. This entry was posted in Corn and tagged corn yield; corn yield prediction. Bookmark the permalink.